The LEDSHDVO LED Dual Voltage Shaver Socket is an ideal shaver socket for your bathroom. 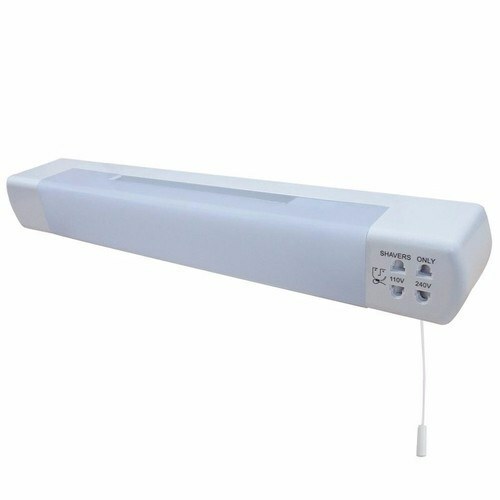 This Shaver Socket comes with Dual shaver ports allowing for multiple devices to be connected at the same time, this shaver socket also acts as a light fitting in your bathroom with a S15 284mm double ended tubular bulb (included). This Shaver Socket is made from Polycarbonate construction, consumes low amounts of energy and is designed with prolonged lamp life in mind. With its instant startup, super bright LED, this gives your bathroom a decent amount of light from this fitting. Arrived as promised, good value for money, easy to fit. All good.... except... unlike any other shaver sockets i have used, the power does not work unless the light is on!. Not useful, if you are charging a shaver or a toothbrush etc. Light has to stay on all day!